Shelly is 38 years old and lives in Beer Sheva with her husband and two year old daughter. Originally from Ethiopia, Shelly moved to Israel when she was five years old. 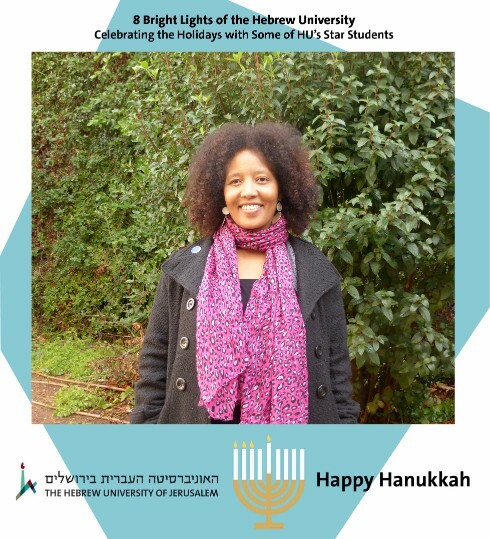 She has worked for the Tel Aviv Municipality in several different capacities including helping families in distress and different projects that support the Ethiopian community. One of my favorite memories was taking a picture with all 9 members of my family in the shape of a menorah, where my dad was the shamash. My mom used to make latkes that we loved to eat, and I remember enjoying seeing the menorahs in the windows. I recently signed a contract for my master’s thesis to be published. This is something I have waited a long time for, and I’m ecstatic that it’s finally happened. What hashtag represents the holidays for you?